Irritability, bloating, cramping, fatigue, headaches, sore breasts, cravings, acne. Ringing any bells? Aunt Flo is back… And she’s GRUMPY. These are “normal” symptoms that many women experience during their time of the month. While society has made it seem acceptable for these symptoms to appear 12 times per year, these are actually signs of dysfunctional menstrual cycle. Premenstrual syndrome or PMS (also known as Premenstrual Dysphoric Disorder or PMDD) are umbrella terms to encompass the many unpleasant symptoms of periods. 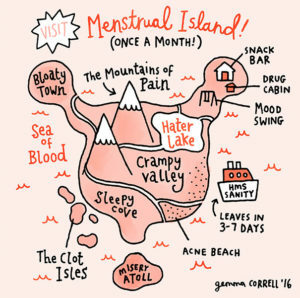 Believe it or not, periods are not supposed to be painful and awful! For many women, they can only dream of having a pain free period. Many resort to taking excessive amounts of painkillers, planning their lives around their cycle and even suffering from depression or anxiety from their menstrual issues. Aunt Flo doesn’t have to be the word that rhymes with witch that everyone thinks she is! Acupuncture and herbal therapies can soothe painful cramps and ease emotional symptoms in the short term; and with a regular treatment schedule, acupuncture balances hormones, regulates your cycle and works to reduce and eliminate your PMS symptoms. According to a study done in 2014 (Jang et.al, 2014), PMS symptoms were reduced by an average of 78% with acupuncture and herbal therapy, lasting for several months. This is why we do tune up treatments! But happy periods require a bit of homework as well! Since acupuncture addresses the body as a whole, you practitioner will also recommend diet and lifestyle advice to help extend your treatments. While the homework is pattern dependant and individualized just like the acupuncture and herbal remedies, here are some basic tips for PMS free periods! Manage your stress (Self care alert!). Yes, easier said than done, but stress can have a huge impact on periods and hormone health. This comes can come in many forms whether it be meditation, journaling, taking walks or exercising. Incorporate for period friendly foods into your diet. These include chickpeas, eggplants, bone broths, nuts such as almonds, fish, and leafy greens. Try using a menstrual cup instead of tampons. This will not only allow you to assess how much you are bleeding, clots and consistency, but it allows the menstrual fluid to flow freely and reduce cramping by limiting stagnation. It’s also hormone disruptor free and eco friendly! Bonus! Hooray! With acupuncture and lifestyle advice now at your disposal, you can now be on better terms with Aunt Flo! She can actually be a very nice lady! 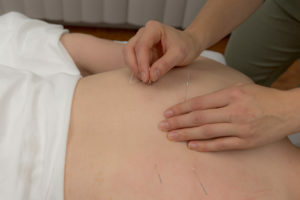 Do you have more questions about how acupuncture can help you with your periods? Contact us! Another great women’s health resource is Optimal Fertility! Check our their site for articles, supplement options and awesome women’s health care info!